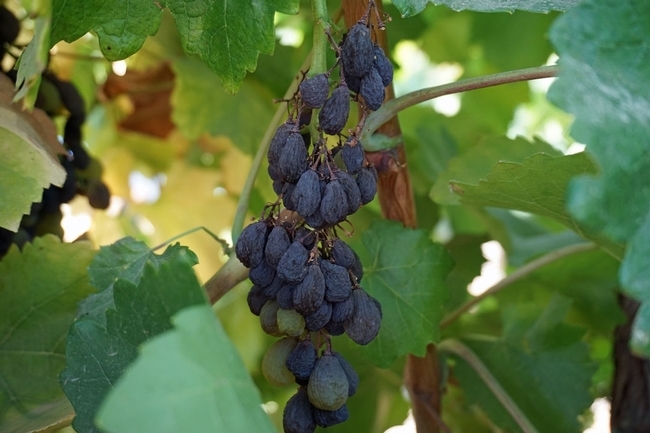 Kearney’s Grape Day highlights viticulture and enology research. Over 115 people came to the 2013 Grape Day at KARE on August 13. Attendees visited a wine grape plot where Larry Williams, professor and plant physiologist in the Department of Viticulture and Enology at UC Davis and Kearney Agricultural Research and Extension Center, demonstrated and discussed the effects of water deficits on water relations and productivity of about 20 different red wine grape cultivars grown in the San Joaquin Valley. The field tour was followed by PowerPoint presentations. 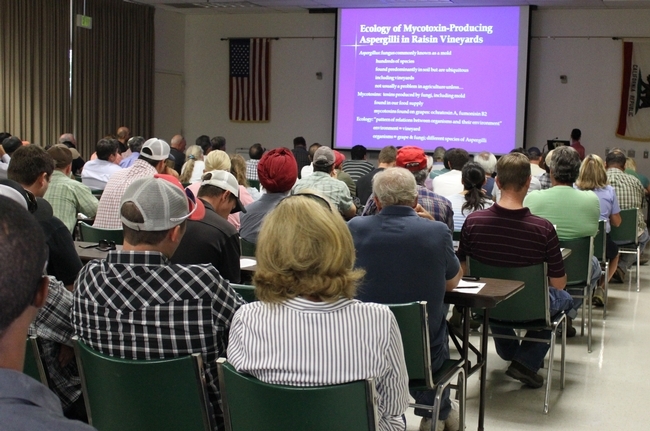 Teresa O’Keefe and Jeffrey Palumbo, scientists at USDA-ARS, provided information on the ecology of mycotoxin-producing aspergilli in raisin vineyards. Matthew Fidelibus, associate CE specialist at Kearney Agricultural Research and Extension Center, provided information on the effects of pre-harvest calcium chloride and chlorine dioxide applications on fruit quality of crimson seedless table grapes. Philippe Rolshausen, assistant CE specialist at UC Riverside, shared information on wood disease management options for grapevines in the San Joaquin Valley. David Haviland, academic advisor, Kern County UC Cooperative Extension, provided information on Movento in table grapes: understanding use patterns and expectations. Andrew Waterhouse, professor in the department of Viticulture and Enology at UC Davis, discussed understanding wine oxidation. More information can be found at the California Ag Today blog. Grape Day 2013 attendees recieving information from PowerPoint presentations highlighting recent viticulture and enology research.